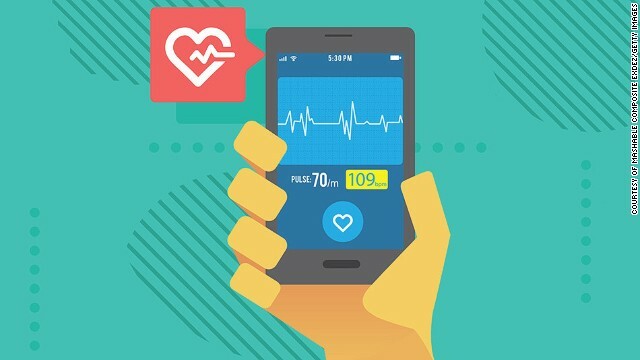 (Mashable) -- 2014 has been a huge year for health tech. According to digital health incubator StartUp Health, digital health funding in the first three quarters of 2014 has already surpassed $5 billion, close to double what was invested in all of 2013 ($2.8 billion). "Digital health funding for the year is on track to double last year's total," said Unity Stoakes, co-founder and president of StartUp Health. "Some trends we're watching include a growing corporate interest in digital health, more global cross-pollination of ideas, as well as increasing health consumerism as people move into the driver's seat when it comes to their care." With this kind of capital pouring into the market, the health tech space should be exciting to watch in the coming years, but here's a sneak peek at what's coming in 2015. "Due to the proximity to the temporal artery, devices worn on the ear can conduct completely unobtrusive, passive monitoring devices worn on the ear can conduct completely unobtrusive, passive monitoring and offer far more precise measurements," says Dr. Vahram Mouradian, founder and CTO of Sensogram Technologies. "Moreover, they can deliver a wealth of wellness information, including real time blood pressure, respiration rate and oxygen saturation, in addition to the typical readings of heart rate or steps taken." We've already seen a few of companies introduce ear buds with basic health monitoring, such as IriverOn and FreeWavz. Watch for increasing sophistication in ear-based devices over the coming year. For example, Sensogram's SensoTRACK — slated for general availability in March 2015 — is an elegantly designed device that fits snugly on your ear, where it measures heart rate, blood pressure, oxygen saturation and respiration rate. It also counts steps and calories burned, while sensing your speed, activity level, geolocation, altitude, body posture and pace. Also keep an eye out for BitBite, the first ear-based device that automatically tracks your eating habits and helps you improve them with real-time dietary advice. The BitBite device fits comfortably in your ear and learns when, where and how you eat. It then analyzes this data and gently nudges you to make adjustments, such as slowing down your eating pace or drinking more water. BitBite doles out its advice either by "whispering" in your ear or by alerting you through the BitBite smartphone app. BitBite just launched its Indiegogo crowdfunding campaign on November 11, with general availability expected in Q2 of 2015. Want even more insight into what's going on in your body? You'll soon be able to track your internal biochemistry with a simple biosensor strip. Electrozyme is developing a printed, flexible strip sensor that inserts into the back of your wearable device and measures the metabolic substances secreted in your sweat, allowing you to track your electrolyte balance, hydration level, muscle exertion and physical performance. According to Electrozyme, the chemical analysis enabled by its disposable biosensors can give people actual insights into their metabolism that go way beyond steps and heart rate. "The advantage of tracking sweat using chemical sensors is that it gives insight into your body chemistry and how it is responding to your workout that is not available using traditional sensors," says Jared Tangney, Ph.D., co-founder and COO of Electrozyme, LLC. "Chemical sensors open up a whole new world of information that was previously never available in wearable devices." Tangney sees a range of different applications for this technology, including letting you know when it's time to drink some water — something most of us probably need: according to some reports, up to 75% of Americans may be chronically dehydrated. You're already carrying around a smartphone with a protective case. Why shouldn't it do double-duty as a medical device? "We're starting to see some initial forays into using smartphones and their cases to measure medical conditions that previously required specialized equipment," says Joanne Rohde, CEO and founder of Axial Exchange. "Imagine an electrocardiogram anywhere — not just at your doctor's office — or a DIY blood test to check your glucose right in your pocket. Some of these innovations are already available, but there are many more to come." One of the first to hit the market was the AliveCor heart monitor, an FDA-approved iPhone case that allows you to record ECGs and heart rate on the go. You can rest it on your fingers or chest to record an ECG in 30 seconds, and know right away if atrial fibrillation is detected, which could be an early indicator of stroke. In 2015, watch for more such devices to become available as they pass through the FDA approval process. For example, Azoi's Wello is a mobile health tracking device which doubles as an iPhone case and is currently in the process of getting FDA approval. It can measure vitals such as ECG, heart rate, blood oxygen saturation levels, respiration and temperature. There are already thousands of health apps you can find on Google Play or iTunes. Soon, some of these apps may require a prescription. One early example is WellDoc's BlueStar, the first "Mobile Prescription Therapy" for people living with type 2 diabetes. The prescription-only app allows people to input data about their glucose levels, diet, exercise, well-being and other factors, which BlueStar automatically analyzes to give the patient immediate guidance and feedback. BlueStar also analyzes the data for the patient's physician and allows the patient to provide a detailed summary of their progress to the physician for review prior to or during office visits. While you might not see a flood of prescription-only apps hit the app store in January — launching one requires FDA approval, clinical trials, insurance reimbursement and more — WellDoc's co-founder and chief medical officer Dr. Suzanne Sysko Clough says we should "expect to see more Mobile Prescription Therapies for many major chronic diseases over the coming years." Finally, ever wonder why you have trouble drifting off after staring at your iPad in bed? The culprit may be the blue light emitted from your device — the part of the light spectrum that causes the biggest changes to your internal circadian rhythm, which can disrupt your sleep and impact your health. "People who don't get enough sleep have trouble being productive, controlling their emotions and coping with change. They're also at greater risk of major health issues such as heart disease, diabetes and stroke," says Cameron Postelwait of Sewell Development Corporation, developer of the low-blue-light Drift light bulb, which launched in May of this year. Postelwait believes that in 2015, we'll see a much bigger focus on the effects that artificial light has on people's health, as well as new product innovations to address the problem, particularly in clinical environments and hospitals. "A patient in unstable condition requires nurse visits all through the night. Every time the nurse enters the room, he activates some kind of lighting to help him check on the patient's condition and to give medication. This throws off the patient's natural circadian rhythm, which not only disturbs sleep, but may also impact immune response," explains Postelwait. "There's a huge need for lighting that either has an absence of blue light or a way to change the amount of blue light that the patient receives during the day or night." But while too much bright light might be harmful at night, too little during the day can also bring you down. But while too much bright light might be harmful at night, too little during the day can also bring you down. But while too much bright light might be harmful at night, too little during the day can also bring you down. Luckily, there are folks hard at work to add some sunshine to your day. For example, GoodLux Technology recently launched SunSprite, the first wearable device to track daily bright light intake. According to GoodLux, scientific studies have linked bright light exposure to health benefits such as better energy, mood and sleep. "There's so much focus on nutrition and fitness that mental wellness is often overlooked. Bright light sets the body's internal clock, which controls essential components of mental wellness: hormones, energy levels, mood, digestion and sleep," says GoodLux CEO Ed Likovich. "Three out of four of our early adopters report improvements in these essential components to mental wellness." The solar-powered SunSprite boasts dual sensors that measure visible and UV light and lets users know when they've absorbed just the right amount of bright light to maintain health, while also providing tracking for monitoring UV exposure. See the original story on Mashable.